It is a little funny when you get ready to post something, think it through and then delete it because you find it invalid and irrational. One of those things that I didn't post was about fluoride. You see, I drink a lot of bottled water. I don't drink the drinking water though because I think distilled means that everything has been killed in there and it tastes cleaner. I got to thinking that distilled water doesn't even have fluoride which is a mandate for tap water in the effort to protect our teeth. I took some time and looked into it. Yes, there are a few bottled water brands that mention they have fluoride added. But in my research, I found out that there are many doctors out there saying that the level is actually higher than it needs to be as nearly every toothpaste currently has fluoride while it didn't back then. So... that post never happened. Why do I mention it now? I went out to dinner with Kerry, Teri and Lloyd for Kerry's birthday a few weeks back. She was mentioning how her doctor has been urging her to drink a gallon of water a day. We teased her about it slightly and she said to me, "You do it." I actually drink a lot of water each day. But I'm going to take up this challenge and go one step further. 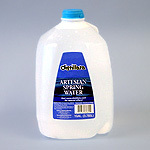 I am putting plans in action to drink... 2 gallons of water on Saturday. Why? I've always heard that you can't drink too much water but you need at least at least 8 - 8oz. glasses per day. I will use this as a learning experience and will begin my training in a Takeru Kobayashi method. I know that I can do it. Let's just say that I'm going to drink a little extra for Teri this weekend. I've always heard just the opposite. Drinking too much water is not good for you. I've heard both! Just don't get stuck somewhere without a restroom if your going to drink that much! The article you posted was rather interesting. I starting skimming through it towards the end. I am still struggling with the gallon a day. I get at least 100 ounces down each day, that last little bit is almost impossible for me, as I find I need to decide between food or water. There simply isn't enough room for both. I have heard it is possible to drink too much water. The body can only absorb so much at one. For a while, I was drinking a gallon of water a day. That was hard - and I was working out 4-5 times a week then. I found myself getting up three-four times a night just to go to the bathroom. Anyway, good luck. Hopefully you won't miss any good football due to being in the potty! I have also read that you can drink too much water. A gallon a day is pretty good - and when you're pregnant, it's extremely important (but feels pretty impossible to do). Good luck with the water this weekend. Hope you don't float away! Update: Finished the first gallon by noon. Second gallon finished by 11pm. I probably could have pushed it further but decided to stretch the last gallon through the rest of the day. Yes, I spent most of the day peeing.